One of our most popular journal sizes, it is large enough for lots of writing, but small enough for easy storage in small places. 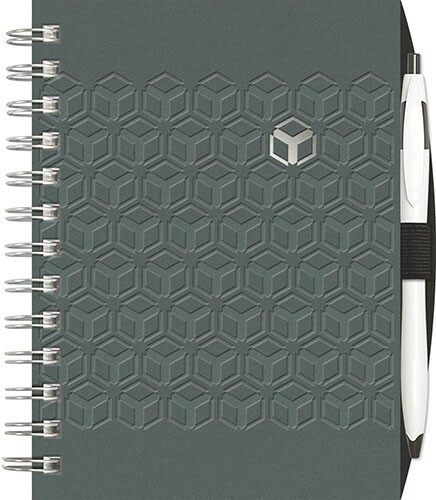 The journal includes 100 sheets of lined premium opaque writing paper. Choose paperboard cover from 5 Express Colors. Custom imprinted front cover only. Up to 2 foil imprints, no other customizing available for this product. This version has the black PenPort back cover with elastic privacy band, Prestige or Cougar Pen. Black binding wire is standard, white, silver, or bronze wire optional. Price includes any one of 36 foil color imprints up to 16 square inches. Quick shipping and Made in the USA.